When field mice meet a small wave, it spells trouble. 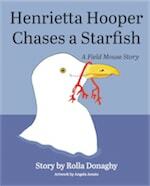 This 1000 word story tells of a challenging trip to the beach for Henry and Henrietta, field mouse twins. For beginning and emerging readers, ages 3-8 years. Hand-sketched art by artist Angela Amato encourages visual perception and language skills.